I Can't Find a Church I agree with? This problem is more common than you might think. I receive hundreds of emails from people with just this struggle. Here is the answer I gave to one person who could not find a church home for his family. Sometimes it is our rigid doctrinal correctness that would rob us of the blessing of a church family. This is an 11,000 word Journal entry dealing with the subject of baptism. It is actually more exhaustive than some books on the subject. Baptists especially have a tendency to think they know everything that can be known about baptism. That unfortunate tendency keeps us from learning many of the most important truth on the subject. This is eye-opening and thought provoking material. Please note: this requires special permission for any duplication or republication, so please do not put this article on any website without written permission. This is going to eventually end up in a book that is being written. . Gospel Preaching - What is it? Most people, and even preachers have little or no idea about what the Gospel actually is. This is an important article, because it corrects many false assumptions, and shows how simple the gospel actually is. This Bible Study goes through every New Testament verse on the word "Church" to examine whether or not Christ has a Universal invisible church in addition to the local visible congregation of Baptized Believers. This is an interesting study, and it raises some questions about the Roman Catholic doctrines that the Reformers brought with them into the Protestant Reformation. The idea of a "Catholic or Universal Church" was formulated in the so-called "Apostles Creed" and remains even in "Reformed" churches. Learn about it here. This article examines some of the pertinent Biblical ideas which should govern music in church services. The primary element of teaching, exhortation, and edification is lacking in much church music, both traditional and contemporary. The article calls for a re-evaluation of the notions of "worship music" and "worship leaders", and suggests a more man-centered approach, which will certainly have some Calvinistic heads spinning. It even challenges the idea that the New Testament church is supposed to be primarily about worship and suggest that church is supposed to be primarily about edification. Perhaps one of the best Baptist Histories available. to provide you something to face the world with. This is a classic Baptist exposition of the term "Church". What exactly does it mean? Does the Bible support the attachment of the words "Invisible" or "Universal" to the word "church". Carroll is a strong advocate that there is no such thing as an invisible or universal church. This is a classic exposition of Baptist church government and polity. A pointed and concise article by Vincent Cheung explaining why the Bible teaches male leadership in the church, and how we ought to challenge the world's accusation that this Biblical concept is sexism. 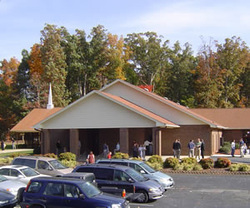 A short article on the two offices in a local New Testament church. Church government is not complicated and Vincent Cheung makes some pointed observations about it here. I am putting this article on my site because it is a concise and easy to follow explanation of Paul's statements regarding women being silent in church. This may not be politically correct for the viewpoint of our modern society. But we do not interpret the Bible based upon social issues or feminist preferences. The teachings of God's word, are what they are, and they say what they say. Paul clearly says women are to keep silent in church. Here's why. This article shows that ministry is an occupation and that payment for services rendered is commanded by God, and is a higher contract than if the ministers were merely employees hired by men. This article destroys the false notion that clergy should be unpaid. Two sermons from pastor Gary Hendrix of Grace Reformed Baptist Church in Mebane, NC. These two sermons are by far the best treatment of the question about acceptable musical forms in the worship of God. Is rock music acceptable? Is Hip Hop acceptable? Are musical instruments acceptable? or are we only to worship God by signing songs dated from the 1800's and sooner? Pastor Hendrix explores the Bible teaching about music, and while he does not address these specific questions, he presents the applicable Biblical verses and principles which will enable any church to define the musical styles that they may choose to use. The emphasis is always upon what does the Bible say, and not on how to I feel about it, or my person likes and dislikes. I highly recommend these sermons for anyone interested in the music of their church. Worship is never to be unintelligible or incomprehensible. In fact the true goal of all worship is comprehension and the conveyance of doctrinal information which is able to edify or up-build the church. This is an important study even though it is short. A peculiar pitfall of the ministry is discussed, and this problem is more serious and prevalent than you may think. Every Godly pastor needs to guard against all the subtle devices of Satan linked to Pride. If you are a pastor. This is for you. Beware of The Expository Preaching Trap! Every pastor needs to read this important article about preaching methodology. True preaching must be characterized by elements that are missing in almost all expository, verse by verse preaching. Verses to help you answer this question. Soft words and watered down speech seems to be the norm for presenting the gospel message today. But in most cases there is actually very little gospel actually being presented. The whole affair is designed to molly coddle the sinner, and make him feel good about himself. To present the happy side of Christianity in glowing and attractive words means that we never use harsh language, or scathing rebukes of sin. Old fashioned hell-fire and brimstone preaching is definitely out of the question. We are now much more civilized than that. Dialog has replaced diatribe, and "sharing" has replaced preaching. Homilies and sermonettes have replaced sermons and vivid descriptive language. Painting electrifying word pictures that captivate the imagination and mind has been replaced by slides and videos on a big screen. Theater has replaced theology. And churches are now houses of feel good entertainment, rather than holy places where men meet a Holy God. God has been reduced to one attribute alone...Love, and there is never anything about His retributive justice, His Sovereignty over all things, or His anger against sinners. In fact, in the modern pansy-fied gospel, there is no mention of sin at all? Smiling preachers talking about how God wants you to own a Mercedes, and live in a mansion, are far more desired than telling people the truth that they are on the road to hell if they do not repent. We have substituted lies for truth and vanity for doctrine, and we have wrung every ounce of life and vitality out of what is supposed to be the true gospel. There is nothing true about today's popular message, so it does not qualify as having any gospel content whatsoever. The time has come for preachers to start preaching so that sinners will actually start listening to something that matters. Silliness and sissyfication have no part in a genuine gospel ministry pulpit. Tar and feather the pantywaist preachers and get somebody who will stand up, speak up, and preach up the whole counsel of God, and not just the parts that tickle the ears. it means having a boat that no storm can sink! and not be pod-cast on the internet! not be broadcast on the internet, MP3's, Videos, Tapes etc. and addicted to, having their sermons broadcast digitally. and is creating a generation of stay at home sermon critics. Today we have many churches that do not know what real preaching is. We have accepted all kinds of substitutes for preaching in our churches, and because of it our churches are stunted, our gospel is powerless, and few if any miracles ever happen. Prophecy is one of the most important miraculous gifts to the church, and churches that do not have it, should be closed, because they serve no purpose other than as a club or party venue. Church is about one thing, "Preaching Christ"! So if that does not happen, board up the place and sell it to someone who will make a junk store out of it! Christ does not use a church that has no true preaching. It is waste of time, for people to attend a church, if they can learn everything at home, and on their own. Church is about a living encounter with Christ and the rest of His people in any given local. If He does not show up at church, then you have no reason to go there either. Preaching - Is it the Word of God? This is an article which could change the way you listen to the sermon this Sunday, or on every Sunday for the rest of your life. We are to receive the Word of God "with all readiness of mind" (Acts 17: 11). This is the revealed way that people are commanded to receive the Word of God. But what Word of God is it talking about? if it will keep him from preparing himself. This short articles exposes the fallacy and deadliness of any pulpit that does not preach the entire counsel of God, in favor of preaching what pleases the flesh and worldly appetites of the hearers. God deliver us from flesh-pleasing pulpits. This is a powerful sermon about a subject seldom heard. We need more eye-openers like this. The spirit of slumber is everywhere in today's weak version of Christianity. is because the world has so much influence over the church! It is shocking how many preachers don't even know what the gospel is. Yet it is the one message which we are supposed to be declaring in this world of darkness. How can we declare it if we don't even know what it is? will be a widow in the next. "Let Him Be Accursed". What does this phrase mean? The teachings of the Plymouth Brethren, known as dispensationalism had began to take hold in England during Spurgeon's ministry. This article by Spurgeon addresses the notion of the dispensationalist's that the church did not exist until Pentecost. Spurgeon viewed this as a heresy, and this article shows why. minister’s study door, and over his pulpit, too. take directives from the world! way offensive. This is a dangerous and dubious practice. Find out why. if he is called to the ministry? or necessarily the urgings of others, this study seeks to remove the mysticism from a Godly call to ministry. This is 39 pages long. A faithful minister must see before he say. otherwise men would be the converters of souls. otherwise it would consist in the wisdom of men. be with the Word of God to give it the power to convert the soul. as great likeness to Christ. the mantle which we wear is nothing but a rough garment to deceive. if the Spirit of God rests not upon us. plague. His name is Apollyon—his work destruction. This is not a long article. It was written way back in 1994, but is amazingly apropos for our day of the emerging church movement, mega-churches, and a completely new style of worship service, featuring spectator elements never before seen in church. Some modern churches are comparable to sporting events or theatrical venues. Rock and Roll, which was condemned by churches just 30 years ago has now almost universally replaced the hymnbook , choir and organ. Big Screens and theater seating, has reconfigured the sanctuary. This is not specific to the current emerging trends, because it was written before most of this newfangled stuff began invading the churches. This is a must read. spiritual apostasy in the church. The next 3 articles might seem offensive, divisive, backward, and hurtful to some people, and that is not the intention here. The 3 articles present 3 historic view of women in ministry. They are historic documents, and are being presented to show the three viewpoints. If you stop reading at the first or second article, you will miss the point entirely. By the same token if you read the third article, without reading the first two, you will not have the information necessary to make an intelligent decision. The first view is a historic Presbyterian view. The second view is a historic Baptist view, and the third view is also a historic Baptist view, but it is substantially quite different from the first two views, both in tone, Scriptural reasoning, and in appreciation for the great work which women have always done in in Service to the Lord. While there is no doubt that technically all three views can be supported by Scripture, and by equally sound exegesis, and indeed all have been adopted officially by various churches throughout history; my personal opinion, is that the third view is by far the most Scriptural, sane and practical view of the three. I think it is the correct view, and that it merits extremely careful study. Mr.Gordon allows for the full and free operation of the Holy Spirit, and the ministry of the of the all the Spirit's gifts in women equal with men, but he stops, (and I think this is Scriptural) with the office of Bishop or Pastor. His view does not allow the ordaining of women to be Pastors of Churches. I believe his reasoning and exegesis on this subject is far superior to the first two view. But I'm presenting all three so you can make up your own mind. the Biblical view of the order of the sexes, especially as it relates to corporate worship, is not a new view. Dabney wrote this long before the currents of feminism and the modern effort to abolish gender specific language from the Bible. The truths of God's word are timeless, and do not vary from generation to generation. John Broadus was one of the most respected Southern Baptist Theologians of his day. I am not presenting his viewpoint in imaginination that there will ever be a return to this way of thinking. I am presenting it as a historic Baptist doctrinal position. Historically I think it is very important to know why our forebears believed and practiced certain things, and to understand how they thought. The words of this short statement, may actually seem curious and stange to our modern thinking, but if you follow his reasoning, you can see that he had good solid justifications for the way he thought and interpreted the Bible on this question. A more moderate and still Biblical Baptist view. Here is a view from a man who was highly respected and of international influence at the latter half of the 19th century. A brilliant thinker, and pastor of one of the most influential pulpits in North America. My opinion is that this view is the most Scriptural, rational, and kind of the three view, and it seems to be the view which puts a premium emphasis on the Ministry and Gifts of The Holy Spirit in the New Covenant age. Please note, this article is a 15 page PDF file. "My punishment is greater than I can bear." it will not pass in power from us. Every preacher needs to read this. It is eye-opening. This article points out that our Homiletics needs to be radically changed. Baptists should not use the system known as "Expository Preaching". This man made system of preaching is completely un-Biblical and this article shows why? if you prayerfully ask the Lord, Is this whats wrong with my preaching? A short statement of some sure identifiers of worldly churches. but preach with fire and pathos and passion. Lord, help us who cannot preach to pray for the man who does! sustain their pastor by their prayers!